Here is look number two from my recent feature in Stellar magazine, remember it's still on shelves now if you want to pick up your own copy! For this outfit I wanted to have lots of colour and texture, so my blue sequinned skirt I nabbed in a warehouse sale last year was just the ticket. I wish I had some closer shots of this skirt, the detailing is so pretty, I will have to feature it in another outfit post soon! 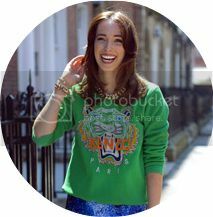 This Kenzo jumper I nabbed on eBay for an absolute bargain price, Im so happy with it, and I know it will be a staple in my wardrobe come Autumn, It's just so cosy! I think I'm going to be wearing a lot of statement-jumper-and-skirt combos in the colder months, I have linked some similar funky jumpers in the outfit description above if anyone is interested in checking them out, they're pretty good value too!